Today, the Nigerian finance minister announced total GDP for 2013 increased to $318 billion USD ($510B PPP) making Nigeria Africa’s biggest economy, even larger than the modernized South Africa. Nigeria is roughly twice the size of California and has a population of 174 million. For a comparison, the entire U.S. has a population of slightly over 300 million and a GDP of $15.8 trillion. Dividing Nigeria’s auspicious total output by its large population gives a per capita GDP of $1,831 USD (or roughly $5 per day). For the biggest economy in the giant continent of Africa, middle class means living on $5 per day. The World Bank defines severe poverty as living off $2 per day. Interestingly, Nigeria’s president, Goodluck Jonathan, was ranked this year as the highest paid politician in the world with an annual total compensation of $84 million USD. This adds to his fortune estimated at $245 million made from a variety of investments in real estate, stock and CoverGirl. He also owns a vodka, several restaurants and a top-selling perfume. Nigeria offers excellent tax rates if you are rich, with a top individual tax rate of 24% and a corporate tax maximum of 30%. In the U.S. the highest tax bracket is 39.6% (although in reality no one in the top 1% pays more than 15% if anything at all). If Mr. Jonathan were taxed at U.S. rates, this year’s tax alone would add $33 million to funding government services for Nigeria’s poor. PPP in economics refers to Purchasing Power Parity which is how we compare the cost of a basket of the same goods in two different parts of the world. It offsets discrepancy caused by exchange rates. Applying the concept of PPP to Mr. Jonathan, his paltry $84 million income in 2013 is equivalent to almost $4 billion in his country. 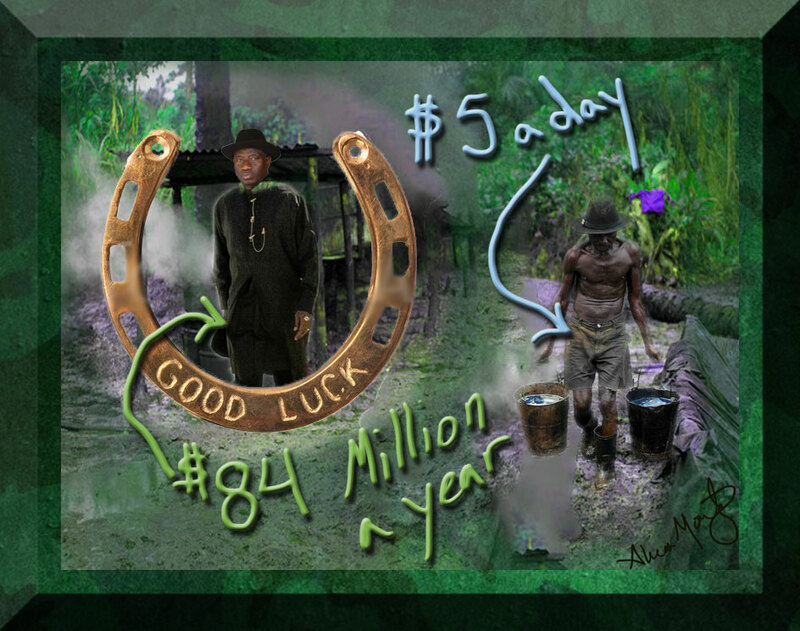 The good luck Mr. Jonathan has in keeping his country’s income tax rate extremely low allows him to accumulate even more wealth. Unfortunately this is bad luck for the people of Nigeria living off $5 per day.